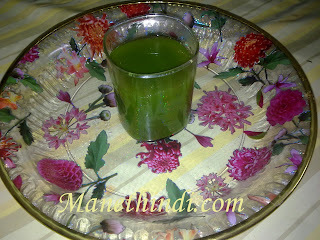 This one's my Mom's recipe:-)Pudina Palak juice is my all time favourite drink. It is a very tasty juice made using mint and spinach leaves and other spices readily available at home. This is a highly nutritious drink which also aids in good digestion. Take a grinder and add all the ingredients above and grind them well. Take a strainer and strain the residue and store only the juice. Add more water/salt if needed. Preparation time: 15-20 minutes .